I am a wine drinker rather than a cocktail imbiber…whether it is that I am too lazy to be mucking about with mixers and garnishes (have I told you how fond I am of screwtops?) or too wise after years of silliness to mess with the high alcohol content of hard liquor is a matter you can decide for yourself. But the cold weather somehow put me in the mood for a proper cocktail and I had brought some good white rum at the Duty-Free on my way home from Puerto Rico. I did come across some unusual cocktails and drinks (Click here for an article that includes an unbelievable cocktail called Toblerone – yeah, as in the chocolate. O.M.G. I will be experimenting with that on another occasion! ), in my search but decided for this time to play with the flavors I already had at home and get some Kahlua in anticipation of another cocktail session. So I called Ashley, who rides shotgun on most of my beverage experiments, and we got to business. A little pantry and fridge rummage later, we had two very good cocktails that use the rum in a martini format. She preferred the pear, I was all over the cranberry. A couple of notes – the honey is a terrific innovation and adds just the right sweet mellowness, but be warned: it will start to drip if it sits too long, so lap it up quick! 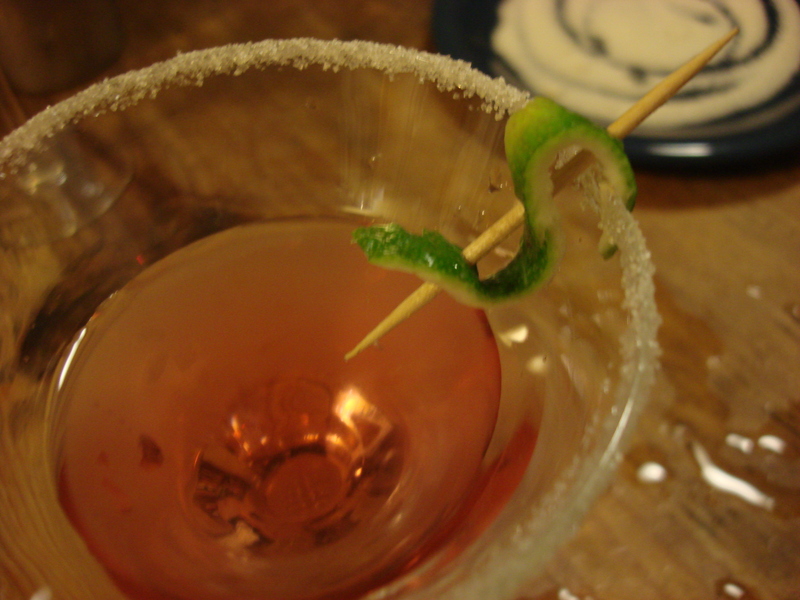 I am particularly pleased with the toothpick-lime peel garnish that I cam up with rather than just tossing the lime peel in. So I am patting myself on the back for that one. 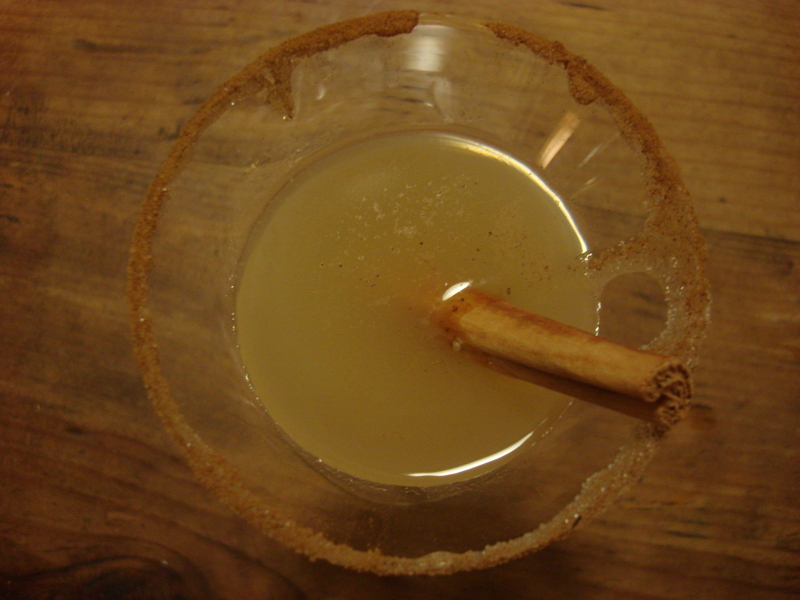 Dip the rims of the glasses in the honey, then the sugar and finally the cinnamon. Shake the rum and juices together with abundant ice and strain into glasses. You may dip the cinnamon sticks into the remaining honey, if desired, before garnishing. You may also sprinkle additional cinnamon on the top. Dip the glasses in the honey and then the sugar. Shake rum and juices with ice, then strain into prepared glasses. 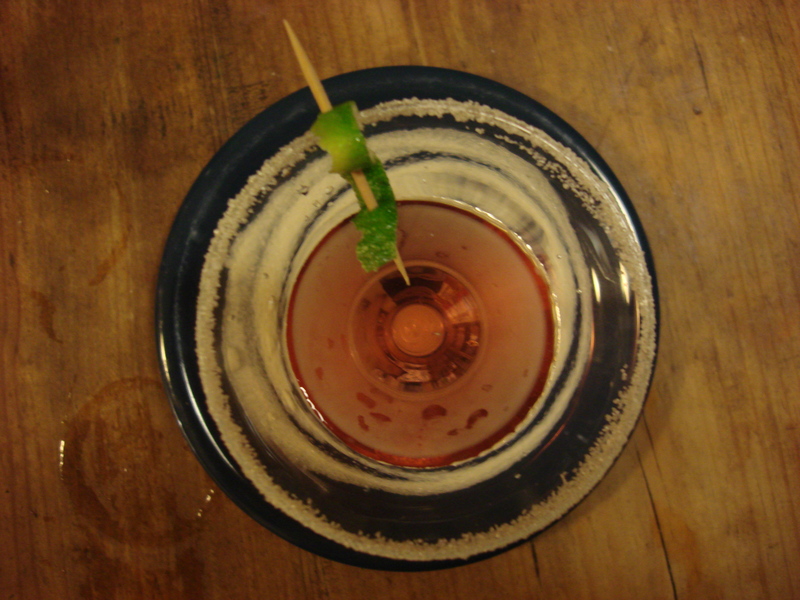 Garnish with lime peel. They both sound good but I think I would be partial to the pear one. Yu are not the first to say that! I knew I’d prefer the cranberry..love the tanginess! 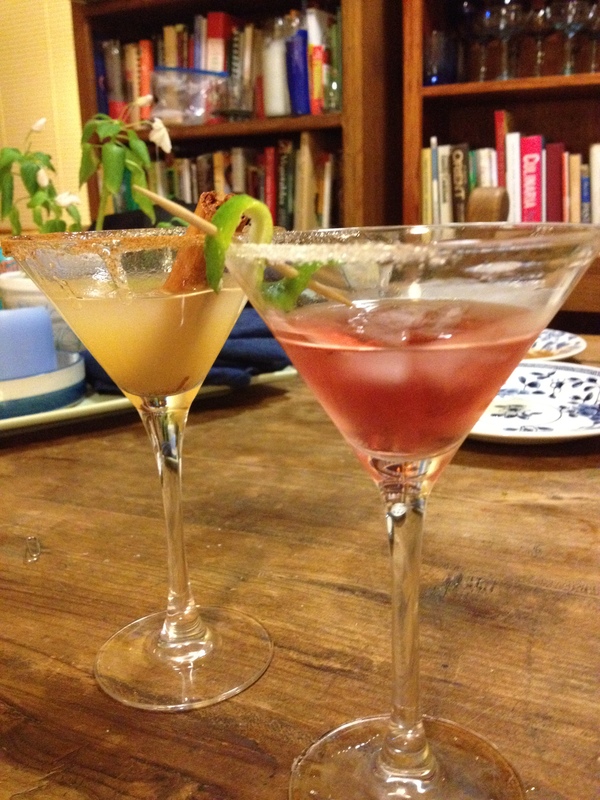 I love the tanginess of cranberry with vodka but there is something about pears and rum that sounded good. The Kahlua does sound great! I volunteer to be a part of that experiment also. It’s a tough job, but someone has to do it. Wow they look great. You know me, if it involves Kahlua, I am in. Very sophisticated looking! Indeed. And you might just have to repeat the taste test several times. Just to be sure! Yeah, I think I will have to try that Toblerone at some point! Sounds incredible!